The priests of the Lord must therefore, so far as reason and prudence suggest, impose salutary and suitable satisfactions, in keeping with the nature of the crimes and the ability of the penitents; otherwise, if they should connive at sins and deal too leniently with penitents, imposing certain very light works for very grave offenses, they might become partakers in the sins of others. The confessor should give a penance that he considers will further the penitent’s chances at salvation, that is, one that is adapted to his particular condition and one that he judges will be carried out. He should take note that even though Trent demands a penance corresponding to the gravity of the sins, still he may, for a just cause, lessen the penance for a number of reasons. For instance […] when the confessor prudently judges that a penance which corresponds to the sins will not be fulfilled. We know that Trent teaches that penance and sins should correspond to each other, but we say that besides this the penance should correspond to the penitent’s capability. In this way, the penance will be a help and not a hindrance to the penitent’ s salvation. When it happens that the penance is neither helpful to his salvation nor fitted to his particular strength or weakness, then the penance is a poison and not a remedy. And yet in this sacrament, amendment of one’s life is the end intended, rather than making all the satisfaction due for sin. The Ritual says this very thing when it tells the confessor to have “the disposition of the penitent” in mind. […] Gerson, Cajetan, and St. Antoninus all teach that the confessor should impose a penance which he prudently thinks the penitent will be able to handle, and which he will readily accept. If the penitent maintains that a penance is too much for him in his weak condition, then, as the saint points out, “No matter how much he has sinned, he should not be refused absolution, lest he despair.” He goes on to say that it is enough in a case like this, to impose the general penance using the words of the Ritual quidquid boni feceris etc. May the passion of our Lord Jesus Christ, the merits of the blessed Virgin Mary and the saints, and all the good you do and the suffering you endure, gain for you the remission of your sins, increase of grace, and the reward of everlasting life. This prayer applies a great deal more to the satisfaction of the temporal punishment of sin than the actual penance imposed. In a sense Mandić did become what Trent calls a “partaker in the sins of others,” but in quite a different sense than the one condemned. To be able to prescribe the right remedy to his penitent’s spiritual sickness, the confessor must know its origin and cause. Some confessors ask for nothing more than the number and the species of the sins. As soon as they are convinced that the penitent is disposed, they send him away almost without a word. A good confessor acts very differently. First he investigates to find out how the sickness started and how grave it has become. He asks if there is a habit of sin, if there are occasions – some time or place or persons or circumstances that provoke him to sin. In this way, he can do a better job of correcting the penitent, of disposing him for absolution, and of giving him profitable remedies for correcting his sins. The confessor should never worry about the ones waiting in line for confessions. As St. Francis Xavier said, it is better to hear a few confessions well than to hear many which bear little fruit. 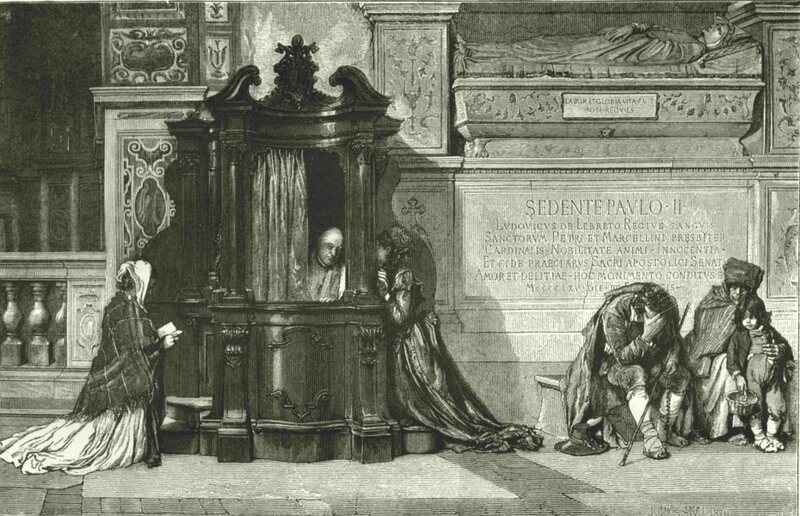 Confessors sin if they come across an indisposed penitent and immediately tell him to leave the confessional, for fear of wasting time with him. Learned theologians have said that, when a penitent comes indisposed, the confessor is obliged as far as possible to dispose him for absolution. To do this, he could tell the penitent, for example, how much his sin’s have offended God, how great is his danger of being condemned to hell, and so forth. And it makes little difference if others are waiting or even if they leave without going to confession, for the confessor is responsible not for them, but for the one who is here and now in the confessional. When the penitent’s ignorance redounds to the harm of the common good. The confessor is a defender of the good of society and he is bound to prefer the public good to the private good of his penitent, even when he realizes that the correction will be useless. Consequently, he must always instruct rulers, confessors, prelates, and parish priests who are neglecting their obligations, because ignorance in these men – even if it is invincible – will always hurt society. People will see what they are doing and consider it all right to imitate them. All instructions on Confession agree that one ought to begin the examination of conscience by calling the Holy Spirit, the Paraclete to one’s aid. This helps us to see the vital point that we must examine our consciences with our hearts full of faith. We must try to look on ourselves as it were with God’s eyes. God knows the graces that He has abundantly sowed in our hearts that they might bear fruit, that they might conform us every more clearly to the image of His Son. The Son of God desires to be able to recognize in us friends and brothers. The Holy Spirit has filled us with His gifts that in our daily work we might ever more become instruments of His love. If one realizes this then one will see how far short of the ideal one falls. Even if one confesses regularly one will see how numerous were the sins of omissions one committed, how many graces one squandered, how bitterly (in human terms) one’s conduct must have disappointed God. The saints wept bitter tears over their sinfulness. They did not do so out of unhealthy exaggeration, but out of a deep knowledge of their souls, a bright light helped them to see their own unworthiness. If we ask Him, God will give this light to us as well. In order to receive the Sacrament of Penance fruitfully it is necessary to fulfill carefully all that belongs to the essence of the Sacrament as well as those things that have always been recommended by the teaching of the Church. These consist principally in a good preparation, the confession of one’s sins, and the fulfillment of one’s penance. Preparation for confession can be further divided into proximate preparation (preparation in the strict sense) and remote preparation. Proximate preparation includes the examination of conscience, which ought to begin with an invocation of the Holy Spirit; contrition for sins committed; and finally the resolution not to commit those sins again and to convert one’s life. Remote preparation includes everything that can be done by the penitent to give himself comprehensive knowledge of his sins, to deepen his contrition, and to strengthen his resolution. It is necessary to fulfill these precepts and councils carefully in order to receive the Sacrament of Penance fruitfully. But when we say that care is necessary we do not mean that we ought to be filled with worry and fear. We must rather be confident in the knowledge that the Church, like a good mother, teaches us these things in order that we might progress toward God as quickly as possible, that our souls might expand and develop ever more richly, and that the peace of God might entirely fill our hearts. We begin with a consideration of the preparation for Confession. I have begun a translation of Friedrich’s Wessely’s pamphlet on Confession which I shall be using for a retreat that I am to give soon. Wessely’s pamphlet was given to me by my own confessor, and I have found it helpful indeed. I shall be posting each chapter separately as well as adding them to a static page. The Rev. 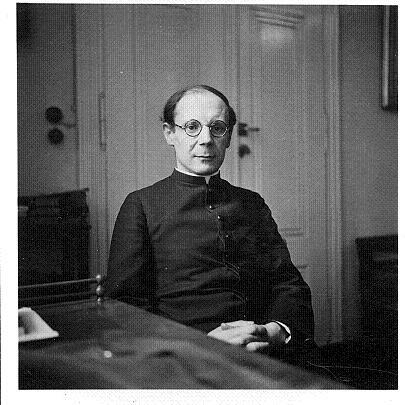 Friedrich Wessely (1901-1970) was a priest of the Archdiocese of Vienna and professor for Spirituality at the University of Vienna. He brought the Legion of Mary to Austria and was and inspired the founding of the Vienna Oratory.